Just Another Day...: Where to Dine? We're in serious need of a new kitchen table. We have a little nook area where our current ugly glass-top table resides. This table was purchased by me pre-hubs from some place like K-mart or Big Lots. In other words, it was cheap. But it has served us well. However, I'm tired of looking at it and am ready for a "real" kitchen table now. So begins my search. I'm not looking to pay $1,200 for a new dining set. I just want a table and some chairs. But WOW is it proving to be harder than I expected! 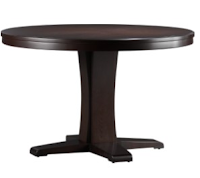 The first (and really only) table I found online that I liked was the Allegro Dining Table from Crate&Barrel. With a price tag of only $399, it could definitely be an option. The problem? It's two-fold. First of all, I really don't care for any of the chair options that can be purchased to match this table. Secondly, I refuse to pay $80 for shipping on a table I haven't seen in-person. What if I don't like it? That'd be another $80 in return shipping. Just not worth the potential waste of $160. Especially since I'd have the chair issue to deal with. On Saturday, hubs, LO and I spent the afternoon visiting various furniture stores in two counties! I was surprised to find there really aren't a lot of regular ol' round tables out there! Nowadays, you'll find a lot of counter height and bar height tables. At first, we weren't thinking we'd like that idea for our kitchen nook area, but after shopping around a bit, I think we changed our minds! We happened to find the Carlyle collection at Ashley Furniture. It's a beautiful contemporary set with a dark mocha finish, and the one we liked best was the Butterfly Leaf Table (an extension "leaf" is built in to and stores in the table itself). I really like this set and am hopeful I can convince hubs to bite the bullet and make the purchase. I think I might go the route of calling this our combined 3rd anniversary/Christmas gift for each other. I think that's the international sign that we've been married awhile... combining gifts and making a purchase for the house constitute said gift. Love the crate and barrel table, but I know how you feel about having to purchase something you've never seen! Thank you for your kind comment on my last post!